CEO of Sunfin Realty Pvt. 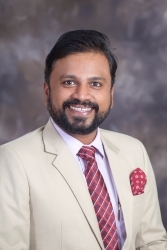 Ltd. , Mr. Abhijit Bhagwat is a post graduate in Business Management with over 18 years of experience in Media, Banking and Finance services and Real Estate. After pursuing his MBA from the prestigious M.S University of Baroda in 1999. He worked with the Indian Express News paper for two years. Then after, He has worked with ICICI Bank in various leadership roles right from Branch manager to Regional Business Head for about 7 years. He ventured on his own in 2007 and started SUNFIN REALTY IN 2008. Till date Sunfin has helped more than 3000 clients in finding their dream property. Rupesh Gandhi is commerce graduate from M. S. University, Vadodara, worked for ICICI Bank Home Loan department for 4 years, 2 years for SUN FINANCIAL SERVICES & working with SUNFIN REALTY PVT LTD from last 10 years. Rupesh Gandhi is one of the founder Pillars of Sunfin Realty Pvt Ltd. Currently he is a Team Manager Heading entire WEST part of Vadodara- Residential property Transactions with Team of 6 Relationship Managers and Two Customer Sales Support. Rupesh Gandhi has handhold more than 200 transactions individually and handhold more than 400 transaction with his team under his guidance. Mahesh Pawar is a commerce graduate from M.S. University, Vadodara, has worked with Ashoka Feb Tech Pvt Ltd as accountant for 3 years, Indian Express as Collection Executive for 3 years, ICICI Bank as Admin & MIS executive for 4 years. He is working with Sunfin Realty from last 11 years as Operation Head. Kaustubh Bhagwat is Arts Graduate (ECONOMICS) from M S University, Vadodara. He was handling Garment Manufacturing and Distribution for his own company- KANS COLLECTION. He is working with Sunfin Realty from Last 9 years as Transactions Head. Aliabbas Tinwala is Post Graduate in Business Management specializing in Finance & Marketing, from SIMMC, Pune University. He has worked with Bhagwati Beverages, Future Generali as Sales Executive. He has been working with Sunfin Realty from last 9 years and has worked as Relationship Manager, Sr Relationship Manager and currently working as Team Manager handling Commercial Property Transactions. In Last 9 years he has handhold more than 180 property transactions individually and more than 400 transactions with his team.